The color pattern of this 40-65 mm long species is quite simple: the snow white body is margined around the dorsum with 3 narrow bands of off-white, red and yellow. 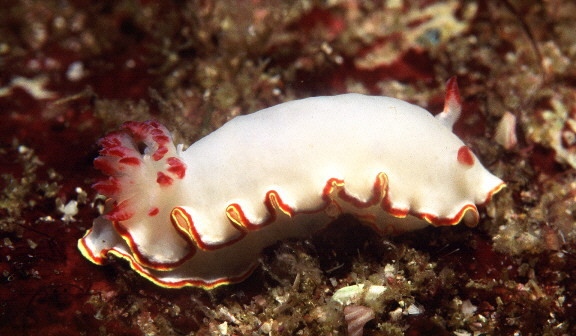 The rhinophores and gills are white basally, tipped with flame red coloration. This species occurs throughout the length of the tropical eastern Pacific (i.e., Panamic) province, from Puerto Penasco in the northern Gulf of California, to the Islas Galapagos. It may be seasonally and regionally abundant or rare. 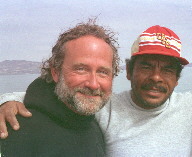 In the summer at Puerto Penasco, it is one of the most abundant opisthobranchs; however this species is quite rare at Bahia de los Angeles. Glossodoris sedna has also been reported rarely in the Caribbean, from southern Florida and the Bahamas. Specimens continually wiggle and vibrate the gills back and forth to increase oxygen exchange. A probably defensive tetracyclic terpene compound called sednolide has been isolated from this species. © The Slug Site, Michael D. Miller 1999. All Rights Reserved.